Lucidity Customization Archives - SDAC Inc. This site highlights MSI Technology's plastic packaging products that it produces. 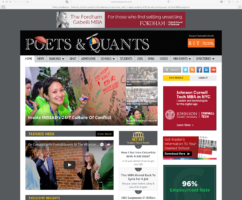 Poets&Quants highlights all things related to MBA programs including news, directories, podcasts, and videos. The site highlights the impactful people, ideas, tools, and schools with the goal to provide an inclusive starting place to make a difference in the world. This site highlights the services of Windsor Realty Group. Lionize Training Center is a local fitness center that offers a number of classes including Jui-Jitsu, Kickboxing, Turbo Kick®, and Cross Training. Custom WordPress mobile theme for Poets & Quants that features a custom slideshow and articles for the mobile readers.